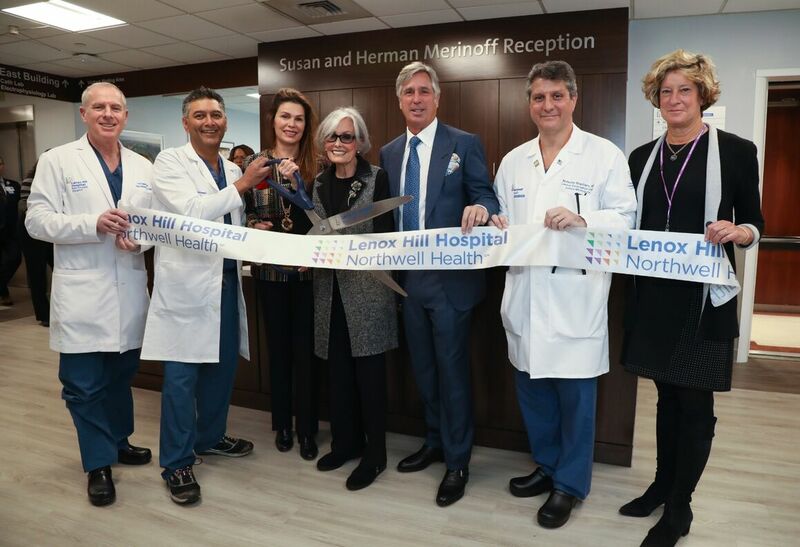 Lenox Hill Hospital has established a brand new Heart Rhythm Center dedicated to the treatment of heartbeat abnormalities. The facility, which includes a brand new procedural laboratory, will offer patients a state-of-the-art program delivering cutting-edge electrophysiology procedures, including complex ablations, minimally-invasive pacemaker and defibrillator implantations, and structural interventions. The space also includes a newly renovated reception area and a comfortable, tranquil waiting room for patients’ families and friends. The revitalization of the reception area was made possible thanks to a generous gift by longtime Northwell Health donor Susan Merinoff. The “Susan and Herman Merinoff Reception” space bears her name as well as that of her late husband. 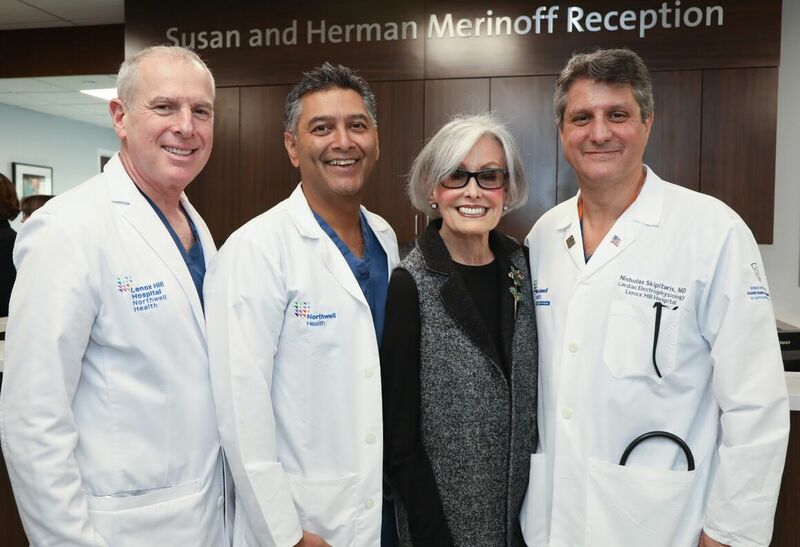 Mrs. Merinoff and her family have been loyal supporters of the health system for several decades, previously helping endow such services as the Palliative Medicine Program at Lenox Hill and the Center for Patient-Oriented Research at The Feinstein Institute for Medical Research. Our cardiovascular and thoracic specialists offer innovative care for heart and lung conditions. We’re one of Healthgrades’ 100 best heart programs in America—placing us among the top 5 percent in the U.S. The heartbeat disorder known clinically as cardiac arrhythmia is a fairly common medical condition in which the heart’s internal electrical system malfunctions causing problems in the rate or rhythm of the heartbeat. According to the American Heart Association, more than 4 million Americans suffer from recurrent arrhythmias. While most arrhythmias are harmless, some may be serious enough to cause organ damage, heart attack, stroke or even death if left untreated. Lenox Hill Heart & Lung, the cardiac and pulmonary service line of the hospital, is equipped with the latest technology to manage and treat the various types of arrhythmias, providing a range of minimally-invasive treatments. In addition, Lenox Hill was one of the first medical centers in the nation to offer a revolutionary sensor vest mapping-system to quickly, accurately and non-invasively identify the exact site of an electrical malfunction within the heart. Lenox Hill’s award-winning cardiology department has been recognized by Healthgrades as one of America’s 100 best heart programs four years in a row – placing it among the top 5 percent in the U.S. Lenox Hill cardiologists were the first in the country to develop and perform many groundbreaking procedures – from the first angiogram to the first minimally invasive heart surgery. At Lenox Hill Heart & Lung, skilled cardiologists offer advanced cardiac services in a variety of areas, including electrophysiology, interventional cardiology, heart failure, structural heart disease women’s heart health and heart disease prevention.